Here are the teams that AUTOMATICALLY QUALIFIED for the 2017 NCAA Division III Cross Country Championships. To do so, a team either had to win its respective regional championship or finish second. 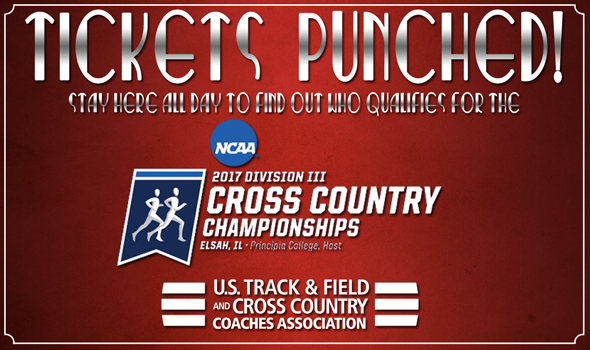 The 2017 NCAA Division III Cross Country Championships will be held on Saturday in Elsah, Illinois. NOTABLES: Carleton, Carnegie Mellon and DePauw were all ranked third in their respective regions and notched an upset to punch their tickets … UC Santa Cruz was ranked fourth in the West Region as of the final Regional Rankings and jumped both Occidental and Claremont-Mudd-Scripps for the automatic bid. NOTABLES: Four of the regions had upsets. Ithaca was ranked third in the Atlantic Region and earned an automatic bid. Calvin entered the meet ranked fifth in the Great Lakes Region. UW-Eau Claire was ranked third in the Midwest Region and won the team title. Tufts jumped both Williams and Middlebury for the second auto qualifying spot in the New England Region.